San Francisco is known for nature, museums, nightlife, shopping, and childrens museums. Your plan includes some of its best attractions: snap pictures at Golden Gate Bridge, get the lay of the land with Walking tours, examine the collection at Exploratorium, and make a trip to Golden Gate Park. To find where to stay, other places to visit, more things to do, and more tourist information, use the San Francisco trip planner . Mumbai, India to San Francisco is an approximately 22.5-hour flight. You can also do a combination of flight and train; or do a combination of flight and bus. The time zone difference moving from India Standard Time (IST) to Pacific Standard Time (PST) is minus 13 hours. Expect colder temperatures when traveling from Mumbai in May; daily highs in San Francisco reach 24°C and lows reach 13°C. Wrap up your sightseeing on the 13th (Mon) to allow time to drive to South Lake Tahoe. Venture out of the city with trips to Homewood (Eagle Rock Hiking Trail & SWA Watersports). There's still lots to do: contemplate the waterfront views at Emerald Bay State Park, steep yourself in history at Hellman-Ehrman Mansion, hike along Rubicon Trail, and take in the awesome beauty at Jobs Peak. To see traveler tips, other places to visit, photos, and more tourist information, use the South Lake Tahoe trip planner. Drive from San Francisco to South Lake Tahoe in 3.5 hours. Alternatively, you can do a combination of flight and bus; or do a combination of train, flight, and bus. Plan for little chillier temperatures traveling from San Francisco in May, with highs in South Lake Tahoe at 20°C and lows at 1°C. Finish your sightseeing early on the 16th (Thu) to allow enough time to drive to Truckee. Truckee is an incorporated town in Nevada County, California, United States. Start off your visit on the 17th (Fri): grab your bike and head to Truckee River Bike Trail, learn about all things military at Tahoe Maritime Museum, and then trek along Tompkins Memorial Trail. Here are some ideas for day two: immerse yourself in nature at Donner Memorial State Park and Emigrant Trail Museum, go for a walk through Truckee River Legacy Trail, and then tour the pleasant surroundings at Truckee Bike Park. To see more things to do, maps, reviews, and tourist information, use the Truckee trip itinerary builder website . Getting from South Lake Tahoe to Truckee by car takes about 1.5 hours. In May in Truckee, expect temperatures between 19°C during the day and 0°C at night. Finish your sightseeing early on the 18th (Sat) so you can travel to Mammoth Lakes. Mammoth Lakes is a town in Mono County, California, the county's only incorporated community. 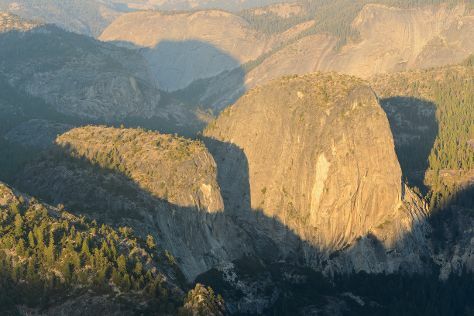 Change things up with these side-trips from Mammoth Lakes: Yosemite National Park (Yosemite Conservation Heritage Center, Valley View, & more). There's more to do: contemplate the waterfront views at McLeod Lake. To see photos, more things to do, and more tourist information, use the Mammoth Lakes trip planning tool . Traveling by car from Truckee to Mammoth Lakes takes 3.5 hours. May in Mammoth Lakes sees daily highs of 21°C and lows of 1°C at night. Wrap up your sightseeing on the 22nd (Wed) to allow time to travel to Las Vegas. Explore the numerous day-trip ideas around Las Vegas: Valley of Fire State Park (in Overton) and Hoover Dam (in Boulder City). And it doesn't end there: ponder the design of Bellagio Fountains, enjoy breathtaking views from Eiffel Tower Viewing Deck, try to win big at Casino at the Venetian, and take in nature's colorful creations at Bellagio Conservatory & Botanical Gardens. To find traveler tips, other places to visit, and other tourist information, you can read our Las Vegas travel route tool . Traveling by flight from Mammoth Lakes to Las Vegas takes 6 hours. Alternatively, you can drive; or take a bus. Traveling from Mammoth Lakes in May, things will get much hotter in Las Vegas: highs are around 36°C and lows about 20°C. Finish up your sightseeing early on the 27th (Mon) so you can travel to Miami. Venture out of the city with trips to JP Outfitters Inc. (in Hollywood) and Everglades National Park (Shark Valley, Gumbo Limbo Trail, & more). The adventure continues: admire the natural beauty at Fairchild Tropical Botanic Garden, see the interesting displays at Vizcaya Museum and Gardens, stroll through Matheson Hammock Park, and indulge in some culinary diversions at a local gastronomic tour. To see where to stay, photos, maps, and other tourist information, use the Miami online travel route planner . Getting from Las Vegas to Miami by combination of flight and bus takes about 8 hours. Other options: drive; or take a train. Due to the time zone difference, you'll lose 3 hours traveling from Las Vegas to Miami. Traveling from Las Vegas in May, plan for a bit warmer nights in Miami, with lows around 27°C. Finish your sightseeing early on the 1st (Sat) to allow enough time to travel to Orlando. Everglades National Park, Coral Gables, JP Outfitters Inc. Pack the 2nd (Sun) with family-friendly diversions at Universal's Islands of Adventure. Have a day of magic on the 3rd (Mon) at Walt Disney World Resort. The adventure continues: get in on the family fun at Universal Orlando Resort, try out the rides at SeaWorld Orlando, discover the magic at Magic Kingdom Park, and add some entertainment to your itinerary with Happily Ever After Fireworks. To find where to stay, other places to visit, reviews, and tourist information, you can read our Orlando tour itinerary maker . Traveling by flight from Miami to Orlando takes 3.5 hours. Alternatively, you can drive; or do a combination of train and flight. In June, plan for daily highs up to 38°C, and evening lows to 26°C. Wrap up your sightseeing on the 6th (Thu) early enough to travel to New York City. New York City is known for museums, nightlife, shopping, historic sites, and parks. Your plan includes some of its best attractions: don't miss a visit to Central Park, pause for some photo ops at 9/11 Memorial, enjoy breathtaking views from Top of the Rock, and admire the landmark architecture of Rockefeller Center. To see where to stay, photos, and other tourist information, read our New York City trip builder app . Traveling by flight from Orlando to New York City takes 6 hours. Alternatively, you can do a combination of flight and bus; or drive. Expect slightly colder temperatures when traveling from Orlando in June; daily highs in New York City reach 31°C and lows reach 21°C. Finish your sightseeing early on the 12th (Wed) to allow enough time to travel back home.